It wasn’t just non-stop rain in Dartford it was non-stop goals as this half of ‘Super Saturday’ in the SCEFL First Division produced a highly entertaining and competitive game that saw Punjab United move to the top of the table after coming from behind twice to go on and win the match 6-2. The Glentworth Club ground plays host to Kent Football United and is in the very early stages of a transformation into a stage worthy of the recently formed side playing their games in the SCEFL Leagues. Newly purchased Floodlights lay pitchside ready for erecting and foundations to a spectator area are sprouting up along the touchline. There are signs of as well as plenty of talk of perimeter fencing surrounding the area going up in the coming months. All of this needs to happen, and soon. Currently I would be surprised if there is a worse spectator experience in this League, especially in the bad weather. The toilets, changing rooms and refreshment area are all below par and that was a shame as it can take a lot away from the matchday experience for those dedicated fans like us that love watching football at this level. Fortunately everyone involved around the club are lovely people and very welcoming, they also have a great side. Kent Football United, or KFU, sit in 4th position in the First Division, their 9 points worth of deductions have prevented them from challenging for the higher places however a win in this one would make it 6 victories on the spin and if their form could continue like that then they would not be far away come the end of the season. The visitors, Punjab United, are in this Division for the first time after being promoted following victory in the Kent Premier League last season. Before this game they were on a 4 match winning run that has helped them to 2nd position and with the other half of ‘Super Saturday’ featuring a showdown between 3rd v 1st there was all to play for here. If results went their way today then by close of play they could even sit top of the pile. The rain came down as the game kicked off and with no sheltered spectator areas I was kind of hoping to be able to remember all the key events from the first half and write them up from memory at the interval in the dry surroundings of the refreshment hut. That plan soon failed and my notepad soon got wet as did the referee’s as he booked two of the visiting team in the first 10 minutes. KFU had started well, they lined up in a 3-5-2 formation and had Tunde Aderonmu leading their line. I was looking forward to seeing the prolific striker play as he is the top scorer in this Division having hit 24 League goals so far, some of those being for FC Elmstead before he transferred over earlier in the season. It was Aderonmu that was to create the first clear chance of the game when on 15 minutes he ran into the box, beat the first man, got the ball past the second man, Fakinos, but was brought down by the right back. The referee had no real option but to point to the spot and KFU had the opportunity to take the lead. Ahmed Deen stepped up and scored to give the hosts the lead. With the two sides being the two top scorers in the Division I was expecting goals and I did not have to wait long until I got the next one. Punjab’s George Goodwin got the ball on the far touchline and aimed his cross towards the far post. Unfortunately his cross was a poor one as nobody got on the end of it, fortunately for him that was because it drifted over the KFU keeper and into the bottom corner of the net. He may claim it was a shot but I am not having that! But it was 1-1 and we had a game on our hands. Ten minutes later we had our next goal and this was definitely a shot. Ahmed Deen looks to be a decent set-piece man as he smashed home a 25 yard free kick into the roof of the net. A great effort from the KFU Centre-Back. 2-1. It was Donaldson that was to get the next goal aswell. In the 40th minute the ball was hoofed up towards the edge of the KFU area. It looked like the keeper Liam Whittaker would clear it with ease yet it he hesitated and let it bounce before attempting to clear again. By now Donaldson was charging in and he won the 50/50 in mid-air managing to knock the ball past the goalie before tapping it into the empty net. Punjab had turned it around and had got their noses ahead before half-time. 2-3. Surely that was it for this half? No, there was time for another and this one was to be the best of the lot. 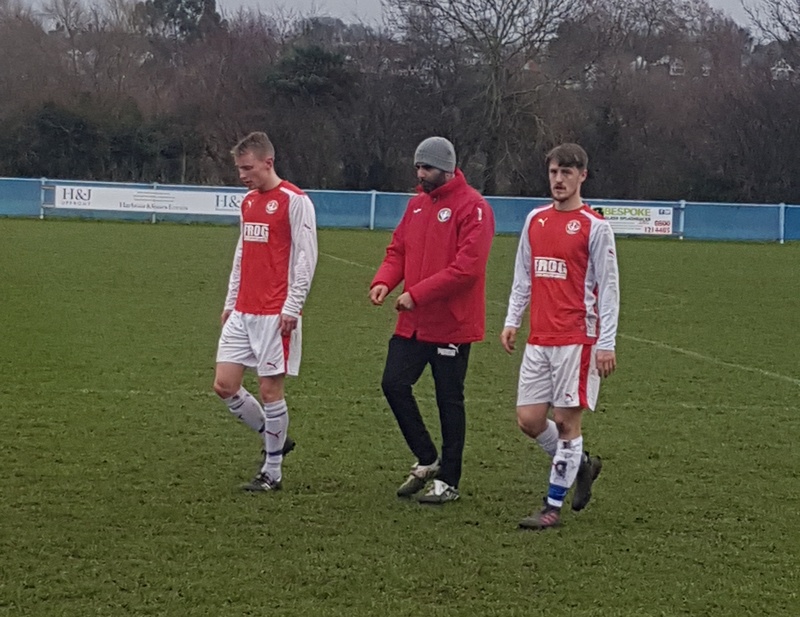 George Goodwin recieved it with his back to goal 30 yards out and as the defence backed off he drove forward and smashed it into the top corner from outside the box. A super finish to make it 2-4. There was even enough time for Goodwin to hit the post before the half-time whistle went and the 49 of us in attendance could go and eat pizza or a sausage roll. You knew the first goal of the second half would be key, either KFU were going to get back in it or Punjab were going to seal it. It was the Punjab that would seal it. The goal in the 51st minute came from a superb pass from the visiting left-back Samuel Olalfe through to Goodwin who went clear one-on-one with Whittaker and finished well. 2-5 and the Punjab forward had got a deserved hat-trick. That goal signalled a change of formation from the home team as they really pushed forward looking for a way back into the game. They went 3-4-3 and really put some pressure on. Punjab were up for the battle though. Paul Lorraine marshalled his defensive line incredibly well. His voice could be heard all around the place as his team mates were forced to keep their line and move up and back when he did. With the rain coming down all afternoon I was unable to film much and was well aware that I had caught the two KFU goals on video but none of the 5 Punjab goals. The away side had scored each time from open play and I wasn’t able to react quickly enough to get any more than a photo of the celebration. So I was a little relieved to be able to catch the final stage of the 6th Punjab goal in the 68th minute. It was a great team move involving half of the team finalising in a great chipped finish from Donaldson to claim his hat-trick. 2-6, Game Over and time for the substitutions to be made. Both hat-trick scorers were brought off as Punjab looked ahead to a tough looking February fixture list. To give them credit, KFU never gave up and for the final 20 minutes they dominated the game. How they did not score was only be down to numerous great saves by the visiting keeper Lee Kidman. The Punjab stopper was inspired in this phase and certainly made the scoreline stay wider than the flow of the game suggested it should be. But as he could not be beaten the game was to end with no further goals and Punjab claiming an impressive 6-2 victory. A win that due to the draw between the other protagonists in this Division would put the Gravesend based side top of the lot and new favourites for the title. Kent Football United will be frustrated by the result as it probably kills off their chances of silverware but it is fair to say they are a better side than the scoreline suggests. They have quality all over the pitch and any issues the club may have are certainly not on the field. They will come again and no doubt have a strong finish to the season and should be aiming for a top 4 finish. Punjab can now have higher aims. They have strength all around the pitch and off it. It is hard to see a weakness within their side and they are as good a side as I have seen this season in this Division and it would be no surprise to me if they won it. Good Luck to both teams for the run-in and thanks to everyone I met on the day as you were all warm and welcoming.